All transactions are safe and secure with a reliable history in online purchasing behind each of our associates. Buy the Jonas Brothers Rock Stars t-shirt to own Jonas Brothers clothing and merchandise. 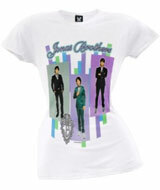 The design on the front of these bestselling Jonas Brothers tees displays the three rock stars looking slick dressed up in suits with their official band logo. Most fans know that the band originated from the success of the Nick Jonas song "Joy to the World (A Christmas Prayer)", which was written by Nick and his father. Eventually, he started writing songs with his brothers, Joe and Kevin. Wear this stylish Nick, Kevin and Joe Jonas t-shirt with a pair of Jonas Brothers sunglasses for the perfect costume. In addition to the Jonas Brothers Rock Stars tee above, browse the Jonas Brothers Clothing Gallery for more apparel like men's and women's clothes, kids shirts or hoodies.